This short beginner course aim is to give you an understanding of the basic principles of working in boards. It includes how to get courage and inspiration to move on in developing your own board methods and active contributions. The focus is primarily on BASIS-bestyrelsesarbejde – the basic board work. BOARD ROOM™ is a short course for you who needs to quickly get settled in the basic tasks and work methods, which ensures that the board can create documented results. This is the first step towards getting an understanding of the differences between operation and board work. If you want to achieve success in your board work, you need to be aware of how to apply your profession competencies in the board context. Even if the tasks seems to be the same, the board context is unique. BOARD ROOM™ focuses on the tools of basic board work containing juridical settings, economical responsibility and the human aspect. You will get insights in the expectations of the board, and how it can create results for the company. BOARD ROOM™ is for you who has an interest in modern board work, but don’t have the opportunity of participating in a board education. 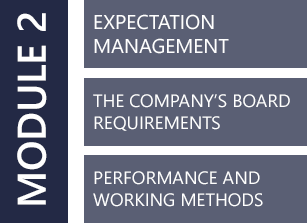 Whether you are new or relatively inexperienced regarding active board work, or would just like to work more in boards, however lacking modern board tools to make a business-related difference – the mini course is a obvious choice for you. BOARD ROOM™ is based on our cooperation with leading researchers in board work and more of the country’s best practitioners in board leadership. you will be presented to development methods, which effect and value in the board context is documented. The course consists of 2 modules of a 2-day duration. The structure of the program is illustrated in the model below. 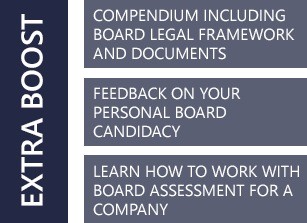 If you are eager for more learning about board work when you have completed BOARD ROOM™, there are lots of opportunities for further personal development. There is a difference between taking a course and a dedicated board education, both in comprehensiveness and the competencies you will achieve upon completion. UWhatever ambitions you might have, BOARD ROOM™ is a perfect way of getting inspiration and knowledge for modern board work. It can even be the start of a new board career, with BOARD ROOM™ giving you documentation of your skills and knowledge. 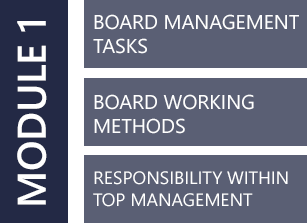 You are welcome to contact us for further information about the board course BOARD ROOM™. BOARD ROOM™ costs DKK. 19.995,00. Paid upon sign up.